BOAT LIFT motorised trailers are designed for the fast lifting and handling of crafts and are ideal for saving time and making maximum use of the areas within shipyards, ports and marinas. 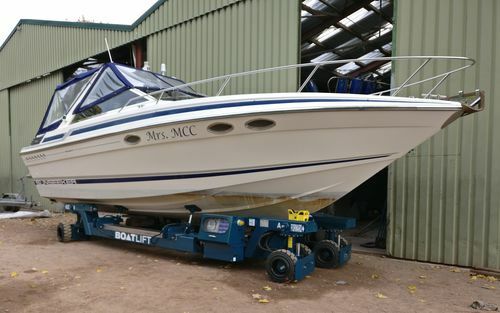 BOAT LIFT motorised trailers are also furnished with a device that allows the gradual speeding up and slowing down of the trailer and avoids risky oscillations of the boat during transportation. Our trailers are equipped with a self-levelling system that guarantees stability to the load even in case of scabbing roadbeds. In the multidirectional version the 90°- degree turn of all wheel units allow the sideways movement of the equipment that makes it possible to save space when manoeuvring and laying up. This is an exclusive feature patented by BOAT LIFT. The hydraulically driven extension system is the result of an innovative project that through highly resistant mechanical posts absorbs stresses and torques caused by bumpy roadbeds. This version, combined with the 90°- degree steering system, allows extending in width the trailer even when standing. All models are available in extensible-in-length versions on request. On-road trailers are equipped with a regular driver’s cab complete in every respect designed and built in compliance with the CE current rules and regulations to guarantee the driver’s safety under any circumstances. They also feature a radio-controlled system for shipyard use. On-road trailers are homologated as Public Work Vehicles for road circulation in compliance with what instructed by the regulations in force. handling trailer / for boats / remotely controlled / all-wheel steering BL240-MES.